KISS ANUNCIA LA SEGUNDA PARTE NORTEAMERICANA DE LA GIRA MUNDIAL “END OF THE ROAD”. KISS ARMY SPAIN IS SHOWING YOU THE OFFICIAL PRESS RELEASE FOR THE FIRST PART OF THE END OF THE ROAD WORLD TOUR. As you all know this is getting hotter than hell and news about The End Of The Road World Tour begin to pop up. Here is the official press release of the first leg of the tour in 2019. CÓRDOBA COMPLETA EL POKER DE CONCIERTOS DE KISS EN ESPAÑA EN 2018. MEGADETH ABRIRÁ PARA KISS EN CONCIERTO DEL WIZINK CENTER DE MADRID. Megadeth, la banda americana de thrash metal liderada por el mítico Dave Mustaine será la encargada de abrir para Kiss en el concierto de Madrid el próximo 8 de julio en el Wizink Center completando así un cartel de lujo. COMUNICADO OFICIAL: COMPRA TUS ENTRADAS PARA VER A KISS SOLO EN LAS WEBS OFICIALES. 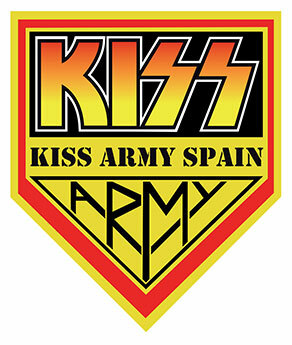 KISS ARMY SPAIN FLETA UN BUS DESDE A CORUÑA PARA VER A KISS EN EL RESURRECTION FEST. ¡¡RESERVA TU PLAZA ANTES DE QUE SE AGOTEN!! KISS EN MADRID: CONOCE LOS PRECIOS DE LAS ENTRADAS Y DEL MEET&GREET. KISS IN MADRID: KNOW THE TICKETS AND MEET&GREET PRICES.